In 5-quart nonstick Dutch oven, cook and coarsely crumble sausage over medium heat until no longer pink. Drain; transfer to large bowl. Cover with foil; set aside. Wipe out Dutch oven with paper towel. Add oil; heat over medium heat until shimmering. Add onion; cook about 3 minutes, stirring frequently, until softened. Add bell peppers and garlic; cook 3 to 4 minutes longer, stirring occasionally, until softened. Using slotted spoon, transfer vegetables to bowl with sausage; replace foil, and set aside. Wipe out Dutch oven. Add quinoa; cook over medium heat 1 to 2 minutes, stirring occasionally, until fragrant. Slowly stir in broth, corn, cumin, chili powder, salt and ground red pepper. Heat to simmering over high heat, stirring occasionally. Cover; reduce heat. Simmer 20 to 25 minutes or until liquid is absorbed and quinoa is thoroughly cooked. Stir in sausage and vegetable mixture; heat until hot. Remove from heat; stir in cheese. 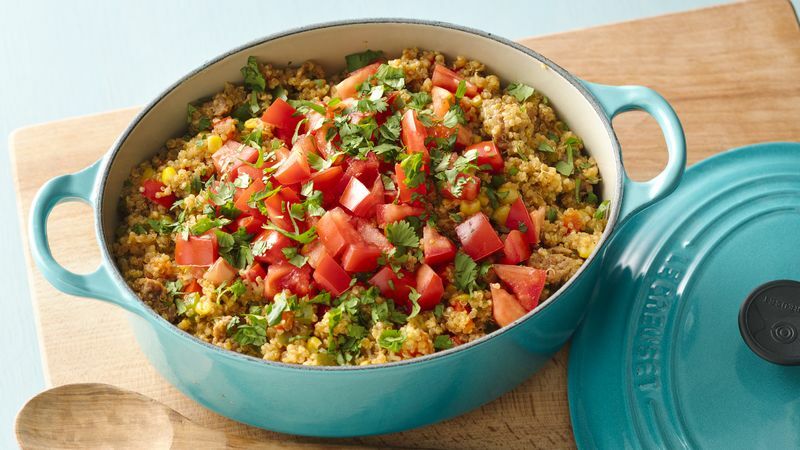 Top with tomato and cilantro. Mexican-inspired dishes are fun to serve because everyone can personalize their serving. Pass chopped avocado, sliced olives, light sour cream and chopped green onions for an extra-special touch. Italian turkey sausage is available in spicy and sweet varieties. We chose spicy turkey sausage, but if your family likes a milder flavour, choose the sweet sausage, and omit the ground red pepper.